OK, guys, it’s time for a very special series to hit the ‘overview’. 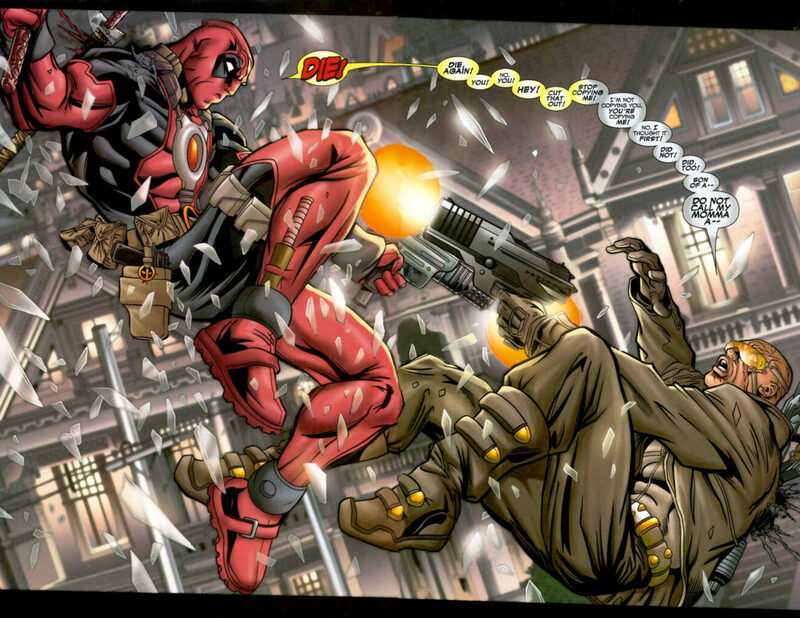 In 2004, Marvel kicked off one of the most humorous books of the past 20 years – ‘Cable and Deadpool’! In honour of that series, this overview will feature a special guest, none other than the Merc With A Mouth Himself – DEADPOOL! Tom: OK, Deadpool, thanks for, ah, agreeing to this. So… Could you give us the behind-the-scenes on how this series came to be? Deadpool: Hey, you forgot something. You were supposed to say ‘how this awesome, unforgettable, best-ever series’ came to be. Remember? Tom: But I’d be lying! I mean, how could this be ‘best-ever’? You had a solo series after this, right? I mean, seriously, does this look like your kissy-face romance book? Tom: …OK. Um, so what made the book so successful? Tom: I’m guessing Cable was also part of the success? Deadpool: Well, yeah, I guess a book about two people, you gotta have good chemistry between them. I mean, Nate was so cool, and cold, and all messianic and serious, y’know? He was the straight man to my funny bone – I think I’m getting the metaphors mixed up. Tom: Fabian Nicieza says he thinks a reason the book got to #50 is that he rooted it firmly in Marvel continuity, and had a lot of guest-stars. Deadpool: Yeah, you needed a score-card, and I made sure people got one. 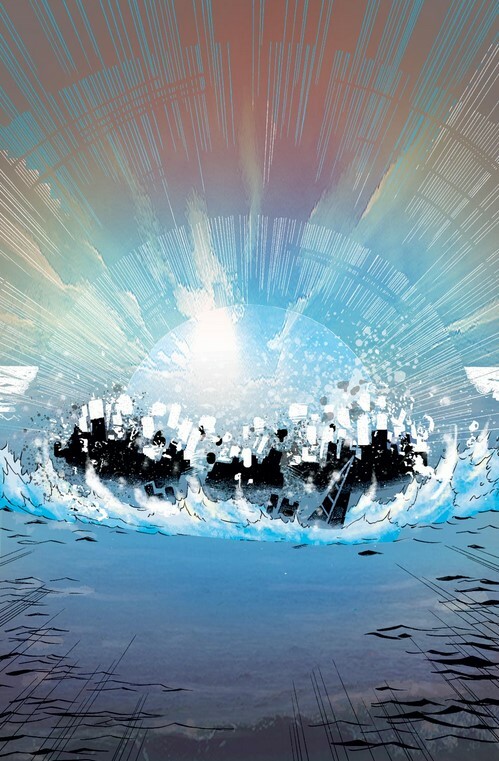 X-Men, Captain America, Silver Surfer, those nubile Young Avengers… Fabe’s idea was to play us against this broad backdrop, like a Turner watercolour but with super-heroes, y’know? Tom: What role did Cable play in the series? Deadpool: He was the plot-driver, with his heavy-duty ‘messiah complex’ – he, like, totally wanted to save the world, and couldn’t get his head ‘round the fact the world didn’t want saving. Sorta shines through in ‘Living Legends’ (#25), where IT’S CAPTAIN AMERICA! throws his mighty shield into Providence, and you get some cool backstory and learn Nate was a shield-slinger himself in his past-future-timey-wimey-stuff. Nate was all about that island, trying to make it a utopia, bring world peace, stuff like that. It’s Cable America! Wait, isn’t that a TV channel..? Tom: And what role did you play? 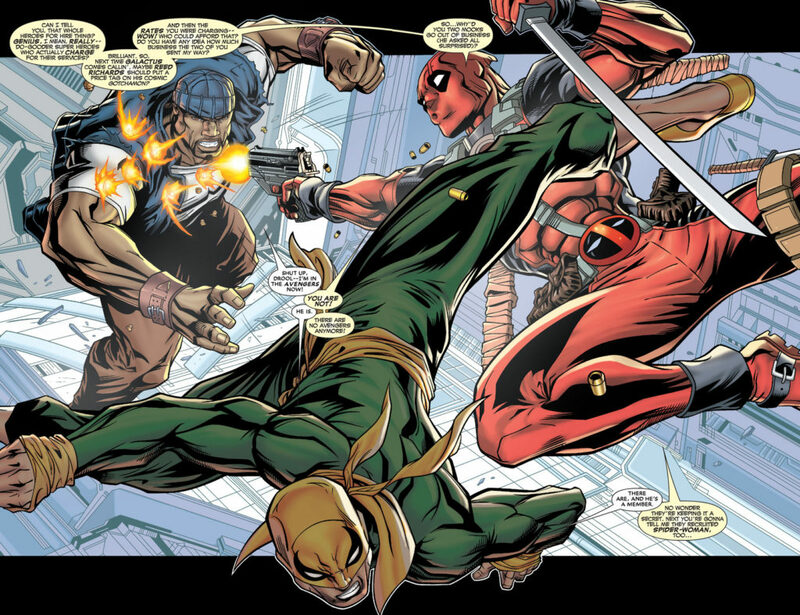 Deadpool: I was the hero! No, really! Me and Nate got tied together – I mean, joint-bodysliding? Eeeeew… I gave the book the humour, and I had fun playing off against everybody else. In #1, I was doing the Bridget Jones (“Don’t wanna be aaaaaall by myyyyyyyseeeeeelf…”), by #50 I had this wacky family around me. Say hello, Bob! I even got to do the Letters pages! Tom: So why did the book end? Deadpool: Crossovers. Nate had this big role to play in ‘Messiah CompleX’ with this kid Hope he had to rescue from the Marauders, so he had to die and the last eight issues were really just me. Which was cool, and led to my own series. Nate got one too, so he wasn’t left out or anything. Tom: OK, could you give us a really quick timeline? ‘If Looks Could Kill’ (#1-6): I’m hired by someone who wants to turn the world blue, and Nate wants to blow up the virus before it can turn the world blue. We wind up Bodysliding together. 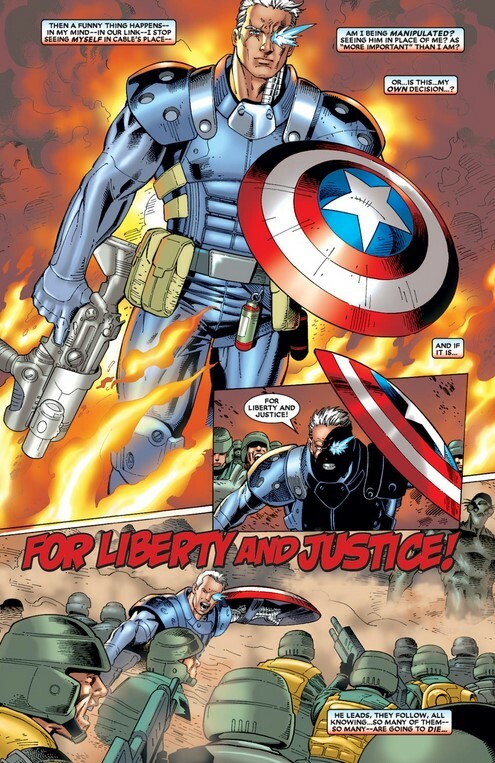 ‘The Passion of the Cable’ (sometimes known as ‘Burnt Offering’) (#7-10): Cable goes on a global stage with Providence, and winds up scrapping with the Silver Surfer, while I try to save his life. Ungrateful cur. ‘Thirty Pieces’ (#11-12): I go on a heroic quest to save Cable’s life, and what thanks do I get for it? ‘A Murder in Paradise’ (#13-14): I’m a mercenary. I kill people. My head gets messed up. Y’know? ‘Enema of the State’ (#15-18): Turns out I’m nuts even for me – someone was playing with my mind! Can’t even remember who now, but it all tied into ‘House of M’ somehow. ‘Why, When I Was Your Age’ (#19): I get to look after teenybopper Cable! ‘Bosom Budies’ (#20-23): Nate gets me to nick technology that’ll simulate telepathy. ‘Sticky Situations’ (#24): Spidey tries to stop me nicking technology that’ll simulate telekinesis..
‘Living Legends’ (#25): Cap infiltrates Utopia, setting up ‘Civil War’. ‘Born Again’ (#26-27): An arc exploring hidden connections between Cable and Apocalypse. ‘The Domino Principle’ (#28-29): Domino tries to stop me killing Flag-Smasher, who’s become ruler of Rumekistan in another Nicieza book! ‘Civil War’ (#28-32): I’m doing my patriotic duty, bringing in the unregistered scum, when Nate goes nuts and even confronts the President! In the White House! ‘Six Packs and Powder Kegs’ (#33-35): I’m with the Six Pack when we do our stuff with Rumekistan and Providence. Nate isn’t happy. He kind of showed me up over the world. ‘Unfinished Business’ (#36-39): I go on another quest, this time to recover my reputation! ‘Fractured’ (#40-42): The Marauders hit Providence, which blows (uh, I mean literally), and we all think Nate’s dead. ‘Alone Again, Naturally’ (#43-50): In a time-jumping, guest-star-busting final arc, I reel and mourn and grieve for my buddy, forgetting he’s gonna crop up again soon. You can buy ’em on Amazon in ULTIMATE COLLECTIONS! Deadpool: Thanks, always glad to be appreciated! Tom: Not a problem. Um, could you untie me now?